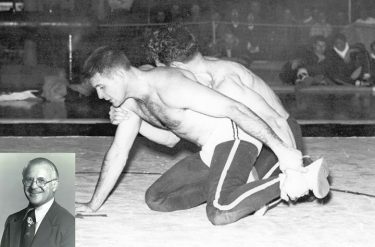 Lowell Lange, a Distinguished Member inducted into the National Wrestling Hall of Fame in 1981, passed away on November 19, at the age of 90. There will be a memorial on January 5, 2019, at 2 p.m. at Canton First United Methodist Church, 930 Lower Scott Mill Rd, Canton, GA, 30115. In lieu of flowers, gifts in memory of Lowell Lange can be sent to the Creekview Wrestling Takedown Club, 1550 Owens Store Rd., Canton, Ga. 30115 OR Cornell College – Wrestling, 600 First Street SW, Mount Vernon, Iowa 52314. Lange won his first National AAU title while still in high school at Waterloo West High School in Waterloo, Iowa. For three of the next four years, he reigned without serious challenge over the nation’s lightweight wrestlers. Had not severe injuries in an automobile accident knocked him out of competition as a sophomore, in the Olympic year of 1948, Lange likely would have become college wrestling’s first four-time champion, as well as an international medalist. But he won three NCAA titles and three more National AAU crowns for Cornell College of Iowa while amassing 160 victories against a single loss. 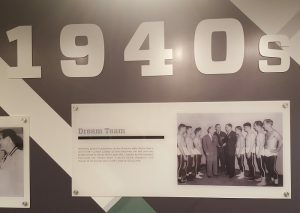 In 1947 he helped the Rams of coach Paul Scott, a Distinguished Member inducted into the Hall of Fame in 1992, capture the NCAA team trophy, the only one ever won by a private school. Returning from injury as a junior, Lange swept through the 1949 collegiate tournament without surrendering a single point, perhaps the only wrestler to do so since scoring rules were adopted. Lange spent the 1951 season as Cornell coach, and still regards the selection of his 130-pounder, Walt Romanowski, as the NCAA’s outstanding wrestler one of his greatest thrills. In 1964, business interests took Lange to Atlanta, where he immediately set out to revive the long-dormant wrestling program at Georgia Tech, taking over the coaching position he held to retirement. Only two years later, his team defeated Auburn in the Southeastern tournament, handing coach Arnold “Swede” Umbach, a Distinguished Member inducted into the National Wrestling Hall of Fame in 1981, his first conference setback in 20 years. Despite the handicaps of a low-budget program, Lange maintained wrestling interest at Tech, while contributing to the success of the sport at the national level. Lange coached the first NCAA All-American from the state of Georgia when Jim Pond, who is president of the Oregon State Chapter of the Hall of Fame, finished sixth in 1966. Lange served as a member of the rules committee and the coaches’ executive committee and helped launch USA Wrestling programs in Georgia.